Our milking herd consists of about 30 milking cows, mostly of the popular Holstein breed, plus Jerseys and several crossbreeds. We raise our animals in balance with our land, producing the forage crops they eat on our own land, fertilized naturally with our own manure and compost. Being hard-working lactating mothers, it is very important for our cows to recieve a well balanced diet. 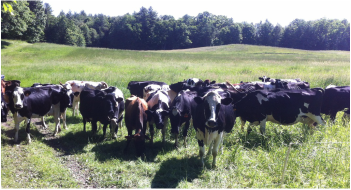 During the spring, summer, and fall, the cows graze on lush pasture,moved twice daily onto fresh pasture, in a process known as rotational grazing. This allows the animals consistent access to high quality pasture during the grazing season in an environmantally sustainable way. Cows are milked twice a day in our renovated 19th century milking barn using a meticulous sanitary process to ensure maximum animal health and product safety and quality. 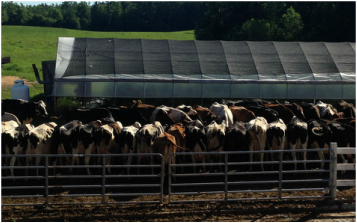 Our herd has always been 100% rBST-free! 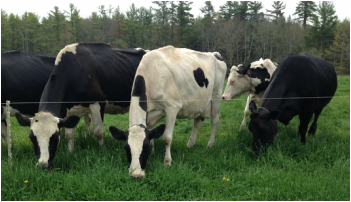 To help balance their diet, the cows are fed quality grass hay and a small supplemental grain mix of corn, soybeans, and wheat, as well as natural vitamin and mineral supplements. 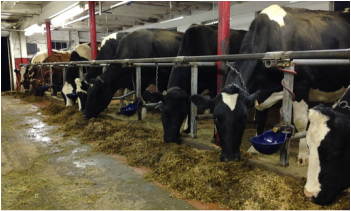 During the winter they are housed inside our milking barn and eat a special combination of hay and silage produced on our farm, as well as supplemental grain and vitamins and minerals. This allows the animals to always have the proper nutrition they need, helping us to maintain our excellent track record of animal health.